Bolivian Foreign Minister Diego Pary said that among topics that the Bolivian side wants to discuss in Moscow are "cooperation with Gazprom and investment into the Center for Nuclear Research"
BUENOS AIRES, March 20. /TASS/. Bolivian President Evo Morales plans to discuss a wide range of topics during his visit to Russia in July, including joint projects in the gas and nuclear spheres, Foreign Minister Diego Pary said on Wednesday on the sidelines of the Second High-level United Nations Conference on South-South Cooperation held in Buenos Aires. "We have an extensive agenda for cooperation with Russia. We are currently discussing what agreements will be signed during the visit of President Morales to Russia on July 11," Pary told Russian reporters. The foreign minister said that among topics that the Bolivian side wants to discuss in Moscow are "cooperation with Gazprom and investment into the Center for Nuclear Research" in Bolivia. Morales said in February that he received an invitation to make an official visit to Moscow from Russian President Vladimir Putin. 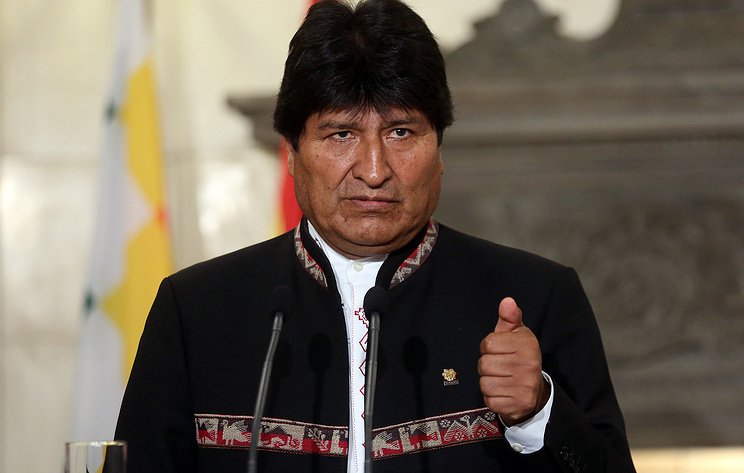 The Bolivian president last visited Russia in July 2018. He held talks with his Russian counterpart and took part in the opening ceremony of the 2018 FIFA World Cup.